AJPM address, phone, website, and more. AJPM is Portland’s most viewed Precious Metals trading website. For over 20 years we have consistently strived to host the most accurate website (our prices refresh every 60 seconds), while offering nationally competitive buy – sell spreads. Whether you are buying or selling Gold, Silver, Platinum or Palladium (we deal in rare coins & diamonds as well), you’ll find no local merchant offering consistently up to the minute published buy and sell prices better than ours. Please take a moment to view the tabs; Gold Bullion, Silver Bullion and our groundbreaking scrap gold calculator (Oregon’s first and ONLY), located at the top of each page. Feel free to call any of our three stores with any questions. Thanks again for checking us out! 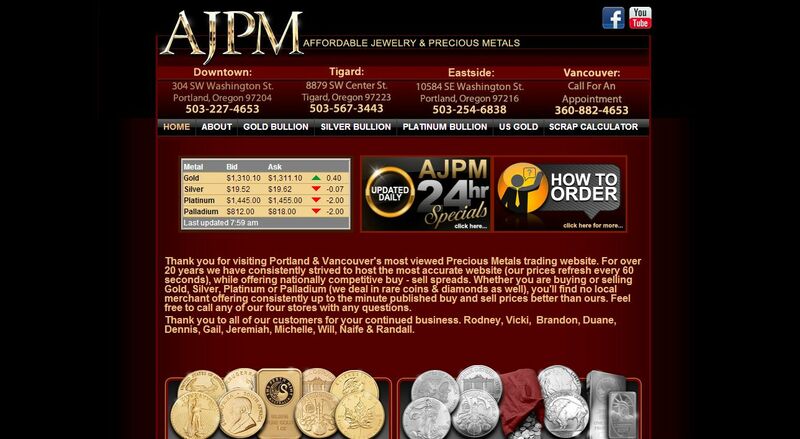 AJPM’s Cash reward: Ajpm is offering a cash reward to the first person who can show us a competitor that pays more than we do for your scrap gold in Portland or Tigard. AJPM was founded by Rodney and Vicki Scott in 1991, but their story begins much earlier. Through hard work and dedication Rodney and Vicki had opened 4 precious metal businesses in the Portland metro area as well as Vancouver , Wa. Another venture was the Portland Minting Company and Medallion Specialties Inc. which was opened in 1986 and the first in the US licensed by the NBA to make “star” player medallions, including Magic Johnson and Michael Jordan to name a few. Other medallions included the Oregon Trail, the Rose Festival, US Military and many more. By 1991 they had consolidated all of their precious metals and jewelry operations into one entity, which stands today as AJPM.